More than one year ago I wrote a review here on Lifestyle Updated, and now my husband asked for a second round. Being the athletic fella, he won’t touch a dancing workout with a ten foot pole, so naturally, when you guys start e-mailing I’m the one who has to sweat. Thanks. Writing this Country Heat review brings back old memories. I reviewed Cize (another dancing routine from Beachbody) more than a year ago, and I know exactly what to look for in this one. And unlike most people who actually decide whether to stick with a program for a month or throw in the towel instead, I had to see this through the end. Final preparations for launching my husband’s workout were near, and he expected me to help. I had only one shot at Country Heat, and here we are now- program completed, with only 2 daily workouts skipped. What follows – if you stay long enough to read – is a comprehensive review of Country Heat. You should note however, that albeit being married to a fitness addict, I know nothing about exercise. Reading this review therefore, may sound silly at times. Oh, and I don’t do bikini pics no matter how many times you e-mail. Drop it Susan! Country Heat review – What exactly is Country Heat? If I say a DVD collection alone, it starts to sound like an awfully inappropriate movie. Besides, Google somehow thinks that I’m interested in light erotica now. Go figure. 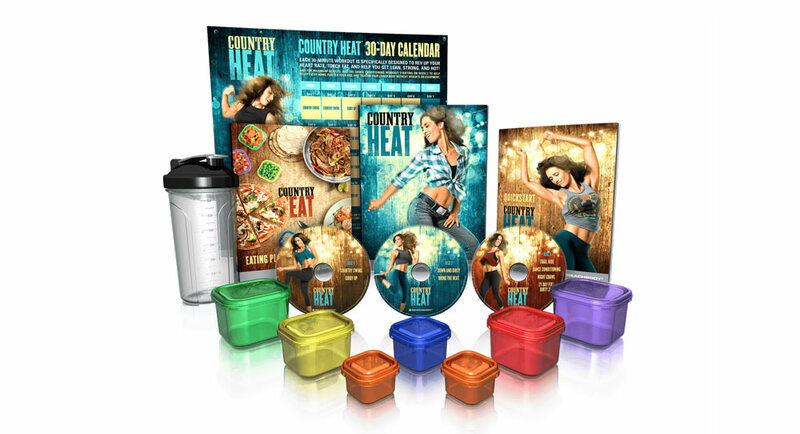 Jokes aside though, Beachbody’s Country Heat is best described as a 30 day country dance workout routine. And while most similar dance programs would have you doing hip hop feats with Mariah Carey in the background, this one is narrowly themed. You are going to hear country music in your sleep and perform a garden variety of moves inspired by country dancing. Being a dance routine, it’s low impact- which means no jumping, and no strenuous and demanding moves that might hurt your knees and ankles. To play a Beachbody broken record, everybody can do it. If you can walk – they say – you can do Country Heat. And while it doesn’t look like a total body workout for strengthening every muscle group, their marketing says that it is still effective when it comes to losing weight. But let’s see how well this statement fares when compared to my experience. Both dance workouts from Beachbody so far have Shaun T’s signature. And they were quite dynamic. Autumn on the other hand, has created 21 Day Fix – a huge hit from what I can tell. Her past experience as a coach though, she says, has offered some valuable insight into why people struggle with weight loss. The most important reason according to her, and I tend to agree, is staying with a routine long enough to actually see results. And for many people out there, myself included, working out can often become an exercise in frustration. Doing push-ups requires herculean effort, so I’d rather abandon my routine altogether. Autumn, despite being a bikini model, seems to understand this all too intimately from her coaching experience. The workouts though are created with progression and variety in mind. People routinely underestimate themed and rhythmic workouts. So when I told my friend I’m starting with Country Heat, her initial reaction was a giggle. Visiting a cross-fit gym herself, dance routines would naturally seem outlandish. But I had a similar experience when mentioning Cize, although I noticeably lost weight nonetheless. Following a structured program that brings your heart rate up, and following a nutrition plan along with it is enough in my book. No extra effort required if you stay dedicated. But let’s go over the workouts from the pack. First of all, you will notice that duration time for each workout time is around 30 minutes. The atmosphere on set is great, natural charisma all over the screen, and nothing looks forced or otherwise overly highlighted. The moves seem fun to try, and the rhythm is cool if you are Ok with country music. Upbeat and uplifting, it’s an energy bonanza. There is a modified included for each move, so you can ease your way into the program. No weights or equipment required, and a step-by-step breakdown of all the moves. The sequences are high energy, and low impact. You learn two moves, combine them, and then continue to the next set. The pace is welcoming at the beginning, but starts to progressively change as you enter the second week. It’s never at an egg-beater speed though. As you are learning some of the more complex moves (though these are rare), you might think that you are lagging behind. Don’t worry. This trooper has discovered that the more you struggle the more you engage your body. I was burning equal amount of calories for the moves I did smoothly, as compared to the moves I struggled to perform. The learning process is a workout on its own. So forget about manufactured emergency to get things right and just try your best. Unlike demanding routines, country swing is not a baptism under fire. It starts slow, builds its pace, but never amounts to an intense routine. Think of it as your welcome to this program. Mostly cardio based moves, and lots of steps. You will feel this routine in your calves and hamstrings early. It doesn’t seem like much, but continual step circuits will have you sweating rather fast. Again with those awkward titles. I imagine people visiting this page totally confused and baffled to see my rant instead of some graphic pics. Sorry there. Blame Country Hea… nope, it doesn’t help. Anyway, this workout is fast paced, and exceeds the previous one in calories burned by a huge margin. My watch showed 400 calories, and I can say I’m pleasantly surprised. It wasn’t hard per say, but I guess you lose track of how much effort you invest when the workouts are both dynamic and diverse. Equally demanding as down and dirty- which in fact is just the same as saying easy. Some of the moves are more challenging that Country swing, but easy to catch on the fly. All in all, it’s a very dynamic and fun workout. A lot of lower body work from which quads are going to have fun. All the moves seem easy, but you will feel the burn rather early. I especially loved this one. Cool music btw as well. This is a more complete workout, which focuses on muscle toning. Less cardio here, but that doesn’t mean less effort required. Looks easy, but muscles will start to burn early. This is how you are going to see some muscle definition apart from losing weight. With music specially created for Country Heat, this is Autumn’s own choreography. Nothing fancy though. It’s a cool workout, but I was expecting more to be honest. Nothing here to be excited about. It’s a printed calendar so you can visualize your journey, which you can hang on a wall or as my husband loves to do on the side of the fridge. The purpose of this calendar is to help you stay accountable, and know what is coming ahead. Some folks use a marker to check completed workouts, but I like to keep my calendar clean. Whereas other programs tell you what to eat, Country Heat takes the liberty to tell you exactly how much. Here is the gist- the program comes with 7 plastic and color coded containers. The system you will use them for is called portion control. And this goes back from Autumn’s fitness bikini, and bodybuilding career. She figured out a way to easily keep track of here meals, so each container is used for a specific type of food. One for fats, another for protein, veggies, etc. The program tells you exactly how much food to put in each container based on a formula. Then, you can eat whatever it is in the box. A simple approach that leaves less room for guesswork. But for someone like me, keeping track of food so diligently can be admittedly remote. So I did my best trying to replicate this system while still eating… well… out of the box. The whole containers thing though is borrowed from here previous program 21 Day Fix, and given how it is mega popular workout, I’d say the feedback was overwhelmingly positive for them to incorporate it into Country Heat as well. When I wrote my Cize review, lots of people wanted to know about the playlist and songs included. So here is a sample from the playlist of Country Heat. All in all this is upbeat music and you will get used to it even if you haven’t previously enjoyed country. Dancing routines usually work in tandem with an audience of women. Not trying to be sexist here, but it would look awfully strange to come home and see my husband sweating to the beats of Cowboy Up by Jill Johnson, doing step moves while shaking with the hips. Anyway… While I can see Country Heat working mostly for women, the demographic group has an incredibly wide spectrum still. People who are overweight and like to shed up to 20 pounds in less than a month, but don’t like to start doing proper and more intense exercises. Again, I would probably sound like the same broken record that Beachbody is playing, but Country Heat is for everybody. This is not to say that you should be invested in the program. You can lose 2 or 20 pounds. It’s up to you. Remember to push hard during the workouts, follow the nutrition plan as much as you can, and don’t forget to pay the sandman and rest your body. This is as much about building healthy habits as it is about sweating with the workouts. In effect, your transformation will last longer, and Country Heat will be your tool to get back into shape, or even improve with each repetition of the entire program. Oh, and this goes without saying, but you will listen to country music for 30 days straight. Yee-haw! This Country Heat review is not complete until we have something to compare Country Heat against. Cize, being a dance workout too, is ideal for this comparison. I remember doing Cize and having lots of fun with it. But Country Heat is different. First of all, though geared towards beginners as well, Cize can be somewhat more complex. Country Heat starts easy and never really touches the complexity of some of the Cize moves. Having in mind that Cize is not that complex either, you can get a more accurate picture of how easy Country Heat is. Many Country Heat reviews will speak of a similarity between the two, but I couldn’t disagree more. This one is more about step movements, and quite easier to catch up with. The results are more or less the same, minus all the extra effort. Plus the modifier makes more sense from my point of view. A lot of country dancing and no hangovers whatsoever. Sign me up, will ya? 1 shaker cup for supplements or their Shakeology drink (though I would recommend you spending extra money on any of these. Simply buy healthy groceries instead). You also get a 30 day 100% money back guarantee less the shipping. The program, if I’m being asked, seems extra cheap when you consider what you get. The price is just two monthly payments of $19.95, plus the $9.95 shipping. It surprises me that Beachbody is making a decent program with bonus gifts included plus the shipping for something less than $50. Where to buy Country Heat? I’m a skinny gal anyway, and between that and preparing for my husband’s workout release two months before trying Country Heat, I’ve already lost 7 pounds even before I started with this program. Country Heat helped me lose those extra 3 pounds, and I feel more coordinated and agile now. But I have really invested myself to be fair. Only skipped two workouts throughout the entire program, due to a hectic schedule the third week, but that’s within the margin many people are likely to fall into themselves. Dance workouts, for me, beat other methods of training nine ways to Sunday. And I haven’t really tried that much of regular and more traditional workout sessions to be honest. My opinion, therefore, is somewhat limited. But why switch a winning team? For me, this works, and though I’m about to start promoting my husband’s workout from now on, dance routines are something I will continue to swear by. I’ll urge you not to put too much stock in your current fitness level as a forecaster of your success with Country Heat. Just give your best, follow the modifier when you feel like you have to, and that’s pretty much it when it comes to having success with this program. I hope this Country Heat review helped you get a more accurate understanding of what this workout is all about. I’ll recommend it to anyone who is on the fence and thinks of starting a workout program. And well… Yee-Haw, I guess. Before you go, you can just check our own workout. Quite awful in doing a shameless plug, I’ll just unceremoniously dump the link here. Fitness Updated is an all-in-one platform with on-demand streaming workouts, and programs for all ages and level of fitness. It has a personalized nutrition program included as well, and smart progress tracking. The videos span from super easy and fun to extra challenging and intense. Plus you have smart algorithms modifying your already customized program on the go. We offer a completely free 7 day trial without asking for a credit card, where you get access to all the features. The interface is neat and elegant, and users love the platform so far. There, I did my fair share of marketing. But no, really… you’d want to check this out. It’s completely free. Oh, and if you ever decide to buy, just use coupon code “30-percent-off” during checkout and lower the price on what is already an affordable product. Good review… but She did not create Piyo. Chalene Johnson is the creator of Piyo. Yeah, you’re right. I don’t how I missed that, but it’s fixed now. Thanks.